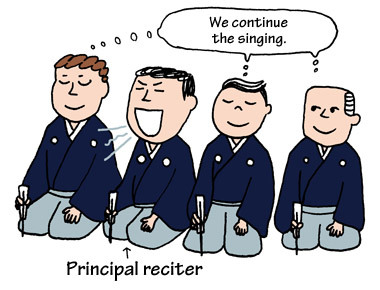 TRIVIA of Noh : Q45 : How can reciters keep themselves in unison, while they are ten or more? | Home | Trivia | Q45 : How can reciters keep themselves in unison, while they are ten or more? How can reciters keep themselves in unison, while they are ten or more? Depending on pieces, a Noh chorus consists of 6 to 12 reciters in two lines, who are actually chosen from leading actors. A principal reciter, jigashira, sits in the middle of the back row. You may have learned in another section (Q19) that Noh music has no definite tonality. Even there is no definite tonality, multiple reciters can sing in unison because they tune their voice to fit the principal reciter's pitch. However, all Noh performers cannot always rehearse together many times. How can the reciters tune their voice to the pitch? There is a technique in which the principal reciter starts and finishes singing first, and others follow him in singing. The audience will find the difference of the volume, rather than the number of the reciters, because they hear a mass of sound in the same pitch instead of multiple voices in different pitches. If reciters too much consider keeping themselves in unison, a chorus may become dull and destroy the atmosphere, or it may lose its power because of insufficient volume. It is important for each reciter to sing well aloud. But he should not raise his voice too much because otherwise the voices are not harmonious or pleasant. Reciters will be required to act in concert with the principal, as well as knowing the technique, in order to sing well aloud and keep time with him. The quality of the Noh music depends on voices in unison and full of life. It is one of the pleasures of Noh watching to compare musical quality.